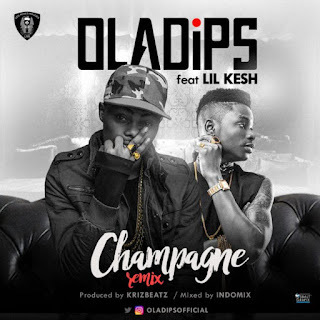 Home / Entertainment / “OlaDips Ft. Lil Kesh – Champagne Remix” | What Do You Think About It? “OlaDips Ft. Lil Kesh – Champagne Remix” | What Do You Think About It? The evolution of new acts in the music industry is becoming so cool and we are having new musicians giving us what we can relate to especially in the rap sector of the naija music industry. OlaDips who have been around for a while, the latest signee under the record label of Reminisce, who is blessed in voicing out cool flows with rhythmic lines. He just released the remix to his latest single. “CHAMPAGNE (Remix)” with the YAGI label owner, Lil Kesh. The original CHAMPAGNE track would be accepted by many as the best track King Dips has ever produced. Or are we safe to rather say his latest is always his best as he improves day by day. The LLR record man went commercial in the song and this remix explained to us the man have come to stay in the industry. Nice one we confirm and we wish Dips continue to give his fans what they really want. What do you think about the Remix? – Oladips vs Lil Kesh, Who Killed the Track more?